Published jointly by The Heritage Foundation and The Wall Street Journal, the Index of Economic Freedom (2008) has painted a global portrait of economic freedom [world average economic freedom pegged at 60.3] and established a benchmark by which to gage a countrys prospects for economic success.It follows a simple tenet: Something cannot be improved if it is not measured. The Index of Economic Freedom has documented the link between economic opportunity and prosperity with research and analysis for 14 years. 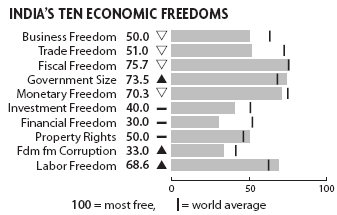 The 2009 Index, covering 162 countries, shows that economic freedom worldwide continues to advance steadily, albeit at a slower rate than one might hope. 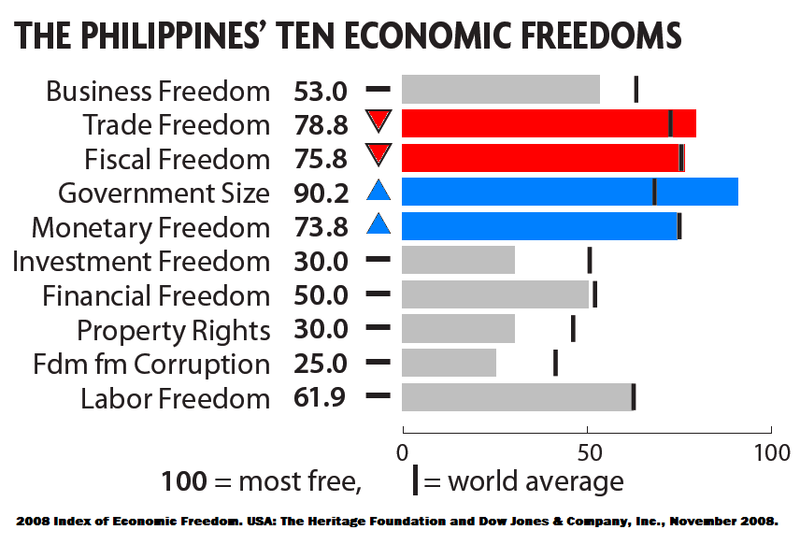 In this 14th edition, most of the 20 freest countries from last year are still ranked among the freest, while others in the middle of the pack have experienced some shuffling as a result of varying efforts at reform. Europe, Asia, and the Americas are the three freest regions. 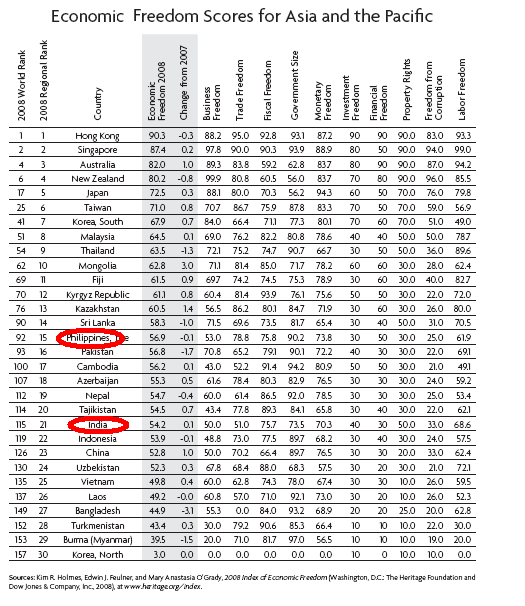 Asia has both the world’s freest economy and its least free economy. More than half of the top 20 freest countries are found in Europe, and the Americas are home to some of the richest and most dynamic countries in the world. Annotations: So, the Philippines beat some 70 countries (about 57%) of the world. I wonder, how India fared? Annotations: Trade freedom in the Philippines have undergone too many changes that in the 1990s the key words were economic reform and liberalization. I wonder what percent every year of the national GDP goes to the deep pockets of some "power-that-be"? Annotations: Two [or four, depends on whose counting] versions of EDSA, and we learned nothing . . . So what’s new? Corruption is free for all! ZTE Broadband, Fertilizer, Coconut, Golden Buddha, Jueteng . . . you name it, oh! they have corrupted it! Only property rights of the rich and powerful are justifiable in this part of the world! Inflation is "fairly high" Question: Do compare the present size of the lowly pan de sal with that in the 1960s?